USA vs England – who has the best local public health websites? enable citizens to become more active with regard to their own health as individuals and concerned citizens. Strong political representation – its clear who the lead politician is and their interest in this agenda. So on the basis of the above I created a set of criteria and used these to rate the public health websites of the six biggest (by population) local authority areas in England. The first challenge is that the search term I used did not always identify a website. In some cases (Birmingham and Liverpool for example) it was hard to find any coherent website. I realise that there may be some fantastic websites that I have missed because I have only searched under this one term. My counter argument would be that any well used website, should be using the tag “public health” and would be picked up by my search. I have tried to be fair and where more than one website has come up in the top 5 on google I have included that as well. Google Rank – what position did the website appear on the google page – if it was first it is ranked 1 etc. Political – is their clear ownership by local politicians – statement from the cabinet lead for health or their name. Coherent view of public health – the scope of the public health agenda is represented across all three domains – health protection, health improvement and social determinants of health. Engages the public – there is an easy way for citizens to sign up for more information and their involvement is encouraged. Strategies and Data – key strategies and data is available – DPH Annual Report, JSNA, etc. Campaigns and information – information about public health campaigns available. Up to date – there is a news feed that has news on it that is no more than 1 month old. The table below sets out my assessment of these websites against the above criteria. If you want to follow the links through to relevant websites – see the link at the end of this table. You will note that there is no website for Liverpool – this is because one did not come up in the top 5 choices. Two types of organisation appeared more consistently than local public health departments. These were Academic Institutions and Public Health Observatories. This is probably because they are committeed to being outward facing – to promote their work and attract students in the case of universities and to share their data and intelligence in the case of PHOs. Local Public Health Departments could learn from this approach. The one area of comparative strength is that most of the websites surveyed did provide access to some local public health strategies and the JSNA. Most areas surveyed do not have a coherent public health portal with public health services scattered across different websites – making it hard to see the connections between different services and approaches. There is a lack of consistency of leadership across public health agendas with a siloed approach – NHS, Community and to an even lesser degree local government. In general there is little interest in presenting clear ways for citizens to engage in the public health agenda. Where attempts have been made to do this they often feel poorly resourced and evidence a lack of long term commitment and direction. (see this Sheffield site – which has 203 health ‘pledges’ – Sheffield is a city of over 600,000 people!). In general the assumption of most websites appears to be that their primary audience is fellow professionals. Too many websites are ‘dead’ with few opportunities for interaction, no live news feeds and evidence that they have not been maintained for some time. For example Liverpool First for Health and Wellbeing does not appear to have been updated for at least a year. No website demonstrated that public health services had strong political connection with the relevant cabinet lead for health. 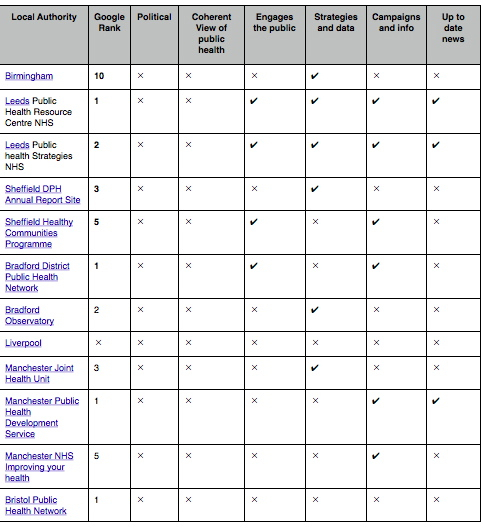 This probably is a reflection of the fact that the leadership role for public health is sometimes assumed to stop with the the Director of Public Health – the Sheffield DPH website in the table above is a good example of this. We would not expect to see a Director of Adult Services or Director of Housing having their own website – local politicians need to step up and own this agenda. To be frank the more I have looked at these websites the more concerned I was at the insular approach that public health has taken so far. Particularly with regard to engaging with citizens and working with local politicians. The move to local government presents a real opportunity to make progress here. However, it will be important to acknowledge that existing approaches for connecting and engaging with the wider workforce and local citizens are not fit for purpose. are there some other criteria I should have included? do you know some great public health websites that you think we should know about? do you know of some terrible ones we should use as examples of how not to do it? Short and to the point Rafal! – our purpose is to change the world not describe it!